Antipsychotic drugs, such as haloperidol and risperidone are FDA-approved for treating schizophrenia and bipolar disorder, but can increase the risk of death in older people who have dementia. A study published Monday by Human Rights Watch finds that about 179,000 nursing home residents are being given antipsychotic drugs, even though they don't have schizophrenia or other serious mental illnesses that those drugs are designed to treat. Most of these residents have Alzheimer's disease or another form of dementia and antipsychotics aren't approved for that. What's more, antipsychotic drugs come with a "black box warning" from the FDA, stating that they increase the risk of death in older people with dementia. The study concluded that antipsychotic drugs were often administered without informed consent and for the purpose of making dementia patients easier to handle in understaffed facilities. Researchers focused on six states, including California and Texas, which have the most skilled nursing facilities. They used publicly available data, along with hundreds of interviews with residents, families and state ombudsmen, the officials who deal with complaints about long term care facilities. In 2012, the federal government began a program to reduce the use of antipsychotic drugs in nursing homes, in partnership with the nursing home industry, and advocacy organizations. Since then, the use of the drugs has dropped by about a third nationwide, from 23.9 percent of residents in 2012 to 15.7 percent at the beginning of 2017. The Centers for Medicare and Medicaid Services have called for an additional 15 percent reduction by 2019 for those nursing homes that have lagged in curtailing their use of antipsychotics. But the Human Rights Watch study contends that the federal government hasn't done nearly enough. It faults the government for failing to enforce laws that exist to protect nursing home residents from what are sometimes called "chemical restraints." An NPR investigation into the first few years of the government's program to reduce the use of antipsychotic drugs found that only 2 percent of cases were deemed serious enough to trigger a fine. The study also calls for the government to strengthen informed consent procedures and to establish minimum staffing levels, something that has long been opposed by the nursing home industry. The American Health Care Association, which represents most nursing homes, said in a statement that the report "does little to highlight the effort launched by our profession in 2012 that has resulted in a dramatic decline in the use of these medications." Tens of thousands of people in nursing homes are being given antipsychotic drugs even though they don't have schizophrenia or other serious mental illnesses. What they do have in most cases is Alzheimer's disease or another form of dementia. A new study from Human Rights Watch says these drugs are used to sedate residents to make them more manageable even though the FDA says the drugs are dangerous. NPR's Ina Jaffe covers aging and has our report. INA JAFFE, BYLINE: Antipsychotic drugs come with what are called black box warnings from the FDA. The warnings say elderly patients with dementia-related psychosis are at an increased risk of death if given these drugs. 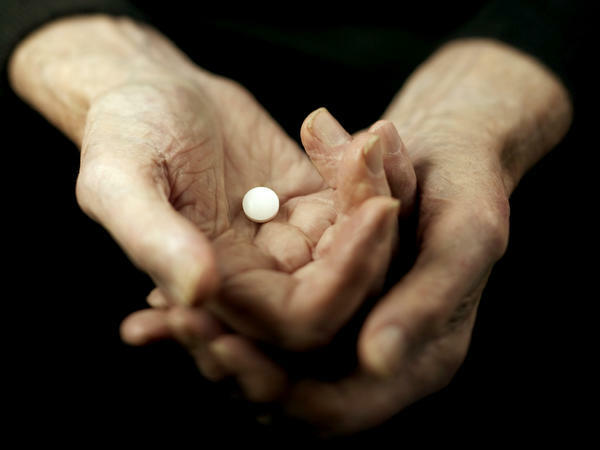 Hannah Flamm, the author of the Human Rights Watch study, says that government agencies have been warning about the dangers of these drugs in older patients since the 1970s. HANNAH FLAMM: And more than 40 years later, the problem persists. JAFFE: Flamm found that 179,000 nursing home residents are receiving antipsychotic medication even though a federal law says that they have the right to be free of, quote, "chemical restraints." Those are drugs that are administered for the sole purpose of making residents docile. Flamm found that the government doesn't enforce that law. FLAMM: Our quantitative analysis found that between 2014 and 2017, 97 percent of citations for inappropriate use of antipsychotic drugs, there was no mandatory financial penalty that attached. JAFFE: This closely matches an NPR analysis of government enforcement data from a couple of years earlier, which found that only 2 percent of the citations issued for unnecessary use of antipsychotics were rated severe enough to trigger a fine. Advocates for nursing home residents have long attributed the overuse of antipsychotic drugs to inadequate staffing. Toby Edelman, a senior policy attorney with the Center for Medicare Advocacy, says many nursing homes don't hire enough workers to handle the residents without using drugs. TOBY EDELMAN: So until we have more professional nurses and more nurse aides, we're not really going to be able to deal with this problem. JAFFE: But there have been improvements. In 2012, the government began a program in partnership with the nursing home industry to help facilities deal with the challenging symptoms of dementia without using powerful drugs. Since then the use of antipsychotics has dropped by about a third. DAVID GIFFORD: And that is a dramatic change. JAFFE: Says Dr. David Gifford, a senior vice president at the American Health Care Association, which represents most nursing homes. He says his industry should get credit, not just criticism. GIFFORD: But I believe that there is clear room for further improvement. JAFFE: Some nursing homes still use antipsychotics too often, says Gifford. On the other hand, if a patient is hallucinating, antipsychotics could be helpful. GIFFORD: To not use the medications and to try to get people off of them would be terribly inappropriate and harmful to residents. FLAMM: May rise to the level of forced medication and cruel, inhuman and degrading treatment under international human rights standards. JAFFE: The government tracks the rate of antipsychotic use at each individual nursing home. That information is available to the public on the website NursingHomeCompare. Ina Jaffe, NPR News. Transcript provided by NPR, Copyright NPR.